US Republican presidential candidate Ron Paul is to end active campaigning, a statement says, and will not campaign in states yet to hold primaries. 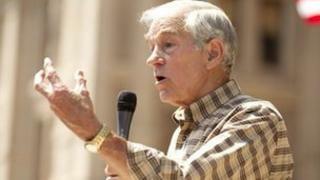 Battling on would require millions of dollars that the Ron Paul operation does not have, his campaign said . But the Texas congressman will continue to try to win delegates awarded at forthcoming state conventions. Mr Paul has 104 delegates, behind Mitt Romney's 966, with 1,144 delegates needed to secure the nomination. "We will no longer spend resources campaigning in primaries in states that have not yet voted. Doing so with any hope of success would take many tens of millions of dollars we simply do not have," he said in a statement. "In the coming days, my campaign leadership will lay out to you our delegate strategy and what you can do to help." Mr Paul is a libertarian-leaning Republican who has opposed the US Federal Reserve monetary system and US military engagement abroad. The 76-year-old, a former obstetrician-gynaecologist, has a small base of staunch supporters and enjoys popularity among many younger voters. In the 2012 election campaign, Mr Paul was consistently ranked in the middle of the pack, neither rising to challenge Mr Romney's front-runner status nor trailing at the bottom of opinion polls. In several contests, in states such as Maine and Nevada, Mr Paul was able to collect some delegates and sometimes a significant portion of the popular vote. But he was viewed by the Republican establishment as a candidate outside party orthodoxy, and he did not manage to win a single primary election. The veteran congressman has previously said he would not run for another term in the House of Representatives.